« Who is the Weaker Among Us? Gaudete! Why the rose candle and vestments? Read it here! 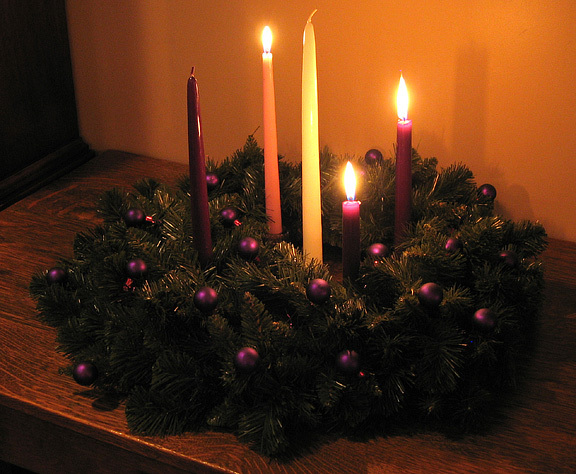 Today we take a break in the penitential season and rejoice at the Lord’s nearness (Gaudete!). But the special Sunday’s of Lent and Advent point also to a deeper truth, the one spoken by the Psalmist in Psalm 145. It is truly a day of rejoicing. Today marks the completion of Coming Home’s first year. It’s been quite a year. When I began on December 13 last year, I posted a few thoughts, turned to Regina and said that it was like yelling out of the spaceship window into the vacuum of space, that there was no one there to hear it. But Jill Stanek gave Coming Home a huge Christmas present on Christmas Eve with a beautiful introduction on her blog, and so the afterburners were lit by one of the most generous and faith-filled women I have ever known. God directs the show, and as I was soon to learn, this blog has been much more an experience of my listening than speaking. It has become a crossroads where I have met so very many in the Pro-life Movement, people who have taught me a great deal. The size, complexity and sophistication of the pro-life movement is mind-boggling, an infrastructure that has developed considerably within the past decade, and which is poised to make considerable inroads in this decade. We are growing in size and influence. 60% of Gen Xers and Mlllennials identify as pro-life. Half of the 400,000 marchers in DC this year were under the age of 30. Gaudete! The sonogram technology has ripped the mask off of the lie that the fetus is nothing more than a blob of tissue, and an ever-increasing majority of the 2300+ crisis pregnancy centers are equipped with this technology. 90% of women who see the sonograms keep their babies. Gaudete! Scientists and physicians in increasing numbers are stepping forward to bear witness to the evidence in our journals of abortion’s horrendous side-effects in obstetrics, gynecology, oncology, psychology, psychiatry, sociology, demography, etc. An editor from a major publishing house approached me recently about writing a book. When a major publisher thinks there are good books to be written, that means they believe that there is an excellent market for the book. That alone is a fantastic sign. Gaudete! Ten years from now the pro-life movement will have made even greater strides. Gaudete! For all that I’ve learned this year, I’m still in my apprenticeship and only now feel that I have some solid footing. This next year should be pretty productive with lots of new projects in the hopper. Gaudete! The Lord truly is close to all who call on Him in truth. He has blessed us abundantly, and the more we work to establish His justice for the weakest among us, the more He blesses us with success, with more happy warriors. My deepest thanks and gratitude to all who have mentored me, encouraged me, commented and opened my eyes to the beauty of this greatest of all movements! Coming Home has been a beautiful experience. What a beautiful family.